Saint Peter’s University today announced a Master of Science in Consumer Science with a specialization in Mobile Intelligence, which will be offered beginning in the fall of 2018. Graduates of this marketing science master’s degree program will be prepared to leverage artificial intelligence, mobile data, business analytics, blockchain technology, location based data and social media listening. The Master of Science in Consumer Science delivers thought leadership on the transformation of advertising in the areas of customer analytics, artificial intelligence and digital marketing. Students will learn how businesses can outmaneuver competitors by selecting digital marketing channels that leverage artificial intelligence in voice, spot audience patterns of behavior, use mobile intelligence, location-targeting and social media listening to surgically target consumers at the right time and right location. The program will also cover critical ethical considerations surrounding the use of artificial intelligence (AI) in leveraging consumer information in marketing. Students will explore case studies and current events related to privacy expectations such as the recent news surrounding Cambridge Analytica and Facebook. 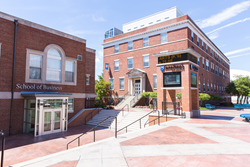 The 36-credit program is offered on the University’s Jersey City campus as well as online. The program is for those students with backgrounds in business, marketing, business analytics, advertising, brand management and information analysts who aspire to take on senior level management positions such as a chief marketing officer or vice president in an advertising agency. For more information about enrollment in the consumer science program, course schedule and program guidelines, please visit saintpeters.edu/academics/graduate-programs/master-of-science-in-consumer-science or contact the Office of Graduate Admissions at gradadmit@saintpeters.edu or (201) 761-6470. Saint Peter’s University, inspired by its Jesuit, Catholic identity, commitment to individual attention and grounding in the liberal arts, educates a diverse community of learners in undergraduate, graduate, doctoral and professional programs to excel intellectually, lead ethically, serve compassionately and promote justice in our ever-changing urban and global environment. To learn more, please visit http://www.saintpeters.edu.